Ahead of the Easter weekend, here’s some of the key moments from the story of Christ’s Passion told using works of art from the collection of the Barber Institute. 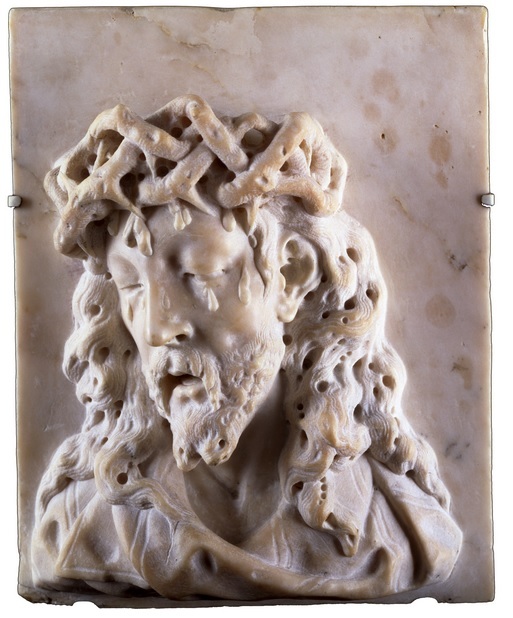 This sculpted marble relief shows the Man of Sorrows. It was made by Orazio Marinali (1643 – 1720), who was one of the leading sculptors in Vicenza near Venice in the 17th and early 18th centuries. The subject of the Man of Sorrows doesn’t actually derive from the New Testament descriptions of Christ’s arrest, suffering and crucifixion which constitute the Passion story proper. Instead, the subject comes from the Old Testament, chiefly Isaiah, who foretold of the coming of a sinless man who will atone the sins of mankind, writing (Ch.53): ‘He was despised and rejected by men; a man of sorrows, and acquainted with grief; and as one from whom men hide their faces he was despised, and we esteemed him not. Surely he has borne our griefs and carried our sorrows; yet we esteemed him stricken, smitten by God, and afflicted. But he was wounded for our transgressions, he was bruised for our iniquities; upon him was the chastisement that made us whole, and with his stripes we are healed.’ Isaiah’s prophecy is thus considered a prefiguration (a prediction, of sorts) of Christ’s ministry and ultimate Passion. And out of Isaiah’s prophecy developed the Man of Sorrows iconography, which typically exhibits precisely the characteristics that we find here in Marinali’s relief: a half- or bust-length image of Christ that is closely cropped, showing him looking grief-stricken, sometimes crying (as in here) and wearing evidence of his suffering including the crown of thorns (as in here). The Barber doesn’t own a representations of the the Last Supper (when Christ announced his upcoming death to his disciples, one of whom would betray him), or the moment when Christ was arrested following Judas’s betrayal. And so we move on to the subject of the Crowning with Thorns. 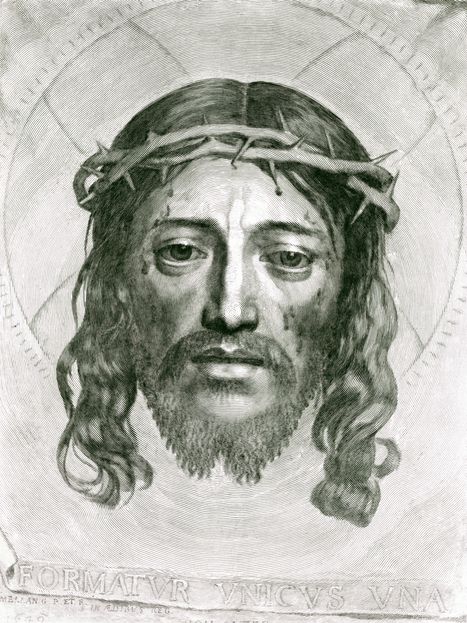 ‘And platting a crown of thorns, they put it upon his head, and a reed in his right hand. And bowing the knee before him, they mocked him, saying: Hail, King of the Jews.’ (Matthew 27:29) Following Christ’s arrest and having been sentenced to death by Pilate, Christ was taken into a hall by Roman soldiers who draped him in a purple robe, placed a crown of thorns on his head and a reed in his right hand (in lieu of a scepter), and then bowed in mock veneration of Christ. This is precisely what’s going on in the above etching by Luigi Pellegrino Scaramuccia (1616-1680), which was made after Titian’s painting of the same subject that is now in the Louvre. Anthony van Dyck’s Ecce Homo was painted at some time between 1621 and ’27 for the noble Balbi family of Genoa. 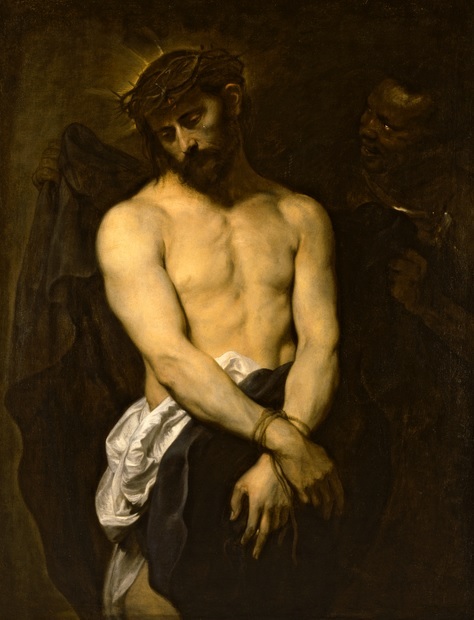 Here van Dyck has also deployed the Man of Sorrows iconography, but this time an episode from the New Testament accounts of Christ’s Passion is illustrated. 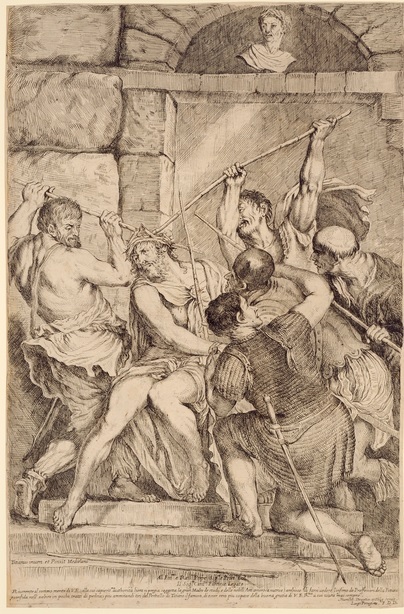 According to John, following the crowning with thorns, Pilate led Christ out to show him to the people, remarking: ‘Behold the Man’, which in Latin is ‘Ecce Homo‘ (John 19:5). Following this humiliation, Christ was given his cross and processed to Golgotha to be crucified. When Christ was carrying the cross on the road to his crucifixion, St. Veronica wiped Jesus’s face using a cloth, on to which there miraculously appeared an image of Christ’s face (hence Veronica’s attribute the sudarium, or “sweat-cloth”, which you often find Veronica holding in depictions of the Carrying of the Cross, or see below for Veronica holding her sudarium on the outside shutter of a triptych). It’s Veronica’s sudarium that Claude Mellan (1598 – 1688) represented in the above engraving. With the rise of print publishing in the 16th century, Veronica’s sudarium became a remarkably popular subject in the printed media, which could be put up in the home as relatively cheap, but compelling, aids to devotion, intended to remind the viewer of Christ’s suffering and death. Mellan’s engraving is an example of this. However, Mellan also pays homage to himself: ‘FORMATVS VNICVS VNA’, the inscription on the bottom of the sheet, translates as ‘the one formed in one’, which is a pun on the uniqueness of Christ, the uniqueness of Veronica’s miraculous image, and, in turn, Mellan’s virtuoso skills, since this entire engraving is made up of a single unbroken line. 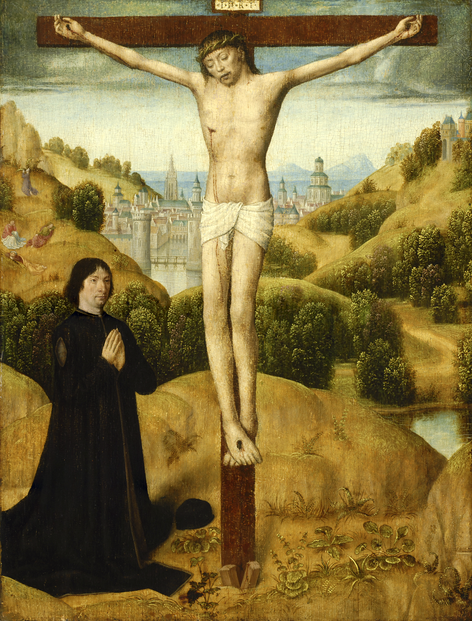 Attributed to a follower of Rogier van der Weyden (1399/1400 – 1464), this triptych (three adjoining panels; the image on the left shows the triptych open, the one on the right the triptych when it’s closed) represents on its inside middle panel the Descent from the Cross, when Christ’s dead body was lowered from the crucifix. On the interior wings, meanwhile, there are 2 further examples of Old Testament prefigurations of Christ’s death: on the left Adam and Eve are shown mourning their son Abel, who was the first human ever to die having been murdered by his jealous brother, Cain; on the right it’s Jacob and Rachel being shown their son Joseph’s bloody coat, which his envious siblings had doused in a goat’s blood to make believe that Joseph had been killed, whereas in reality they’d sold him off as a slave. On the outside shutters, two female saints are shown in semi-grisaille (monochrome grey painting, and semi- in this case because their flesh is flesh-coloured): on the left is Helena, who recovered the True Cross and, on the right, Veronica with the sudarium. Altogether, then, this triptych not only rehearses the story of Christ’s redemption of mankind, but has a special emphasis on notable women and female mourning, which inevitably leads to speculation that the triptych was commissioned by a (grieving?) woman (or an organisation of women – for a convent?). 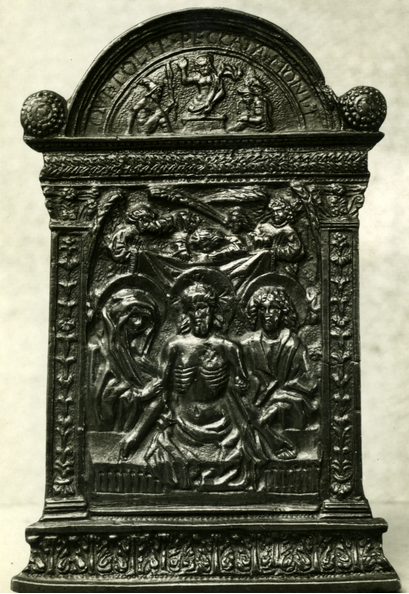 Finally, we return to the iconography of the Man of Sorrows in the above bronze relief, cast by an anonymous Italian artist at some point in the 16th century. The main scene shows Christ being held at his tomb by the Virgin and St. John the Evangelist as well as a few angels; emaciated, with his rib cage exposed, this image is a grisly reminder of Christ’s sacrifice. In the arched pediment at the top of the tabernacle, however, is a small image that hits home at the heart of the Easter story: the resurrected Christ, who rises from his tomb with his right hand raised in blessing, affirming for the viewer that because of Christ they also can hope for resurrection and salvation.